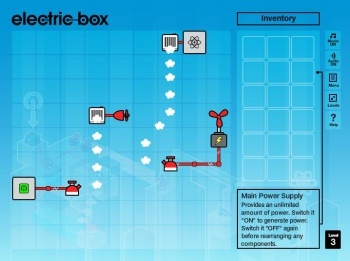 As with last week's Greyscale, Electric Box is a puzzle game that revolves around getting electric power to a final location. Unlike Greyscale, though, Electric Box gives you a whole heaping pile of tools to get the job done. You have a power source. You need to power up your goal. Different objects do different things when fed power: Power up a kettle and it'll generate steam which can be used to power a fan that can both blow the steam off course and turn a windmill that causes a water tank to drop liquid into the turbine, turning on a light switch that illuminates a solar panel... well, you get the idea. It can be confusing at first until you understand some of the rules - magnets only pull things on the same plane as them, and single-direction lightbulbs need to have their power source cut without actually turning off the power source, to name two - but then it just gets fun. Trial and error are the way to succeed, and some of the puzzles can be a bit tricky. But the trickiness makes the final moment of "Aha!" all the sweeter, no? Enjoy this week's Alt+Escape title, and when you figure out how to beat Level 14, please let me know. This one's driving me crazy.